You can pre-order these items at Big Bad Toy Store and Entertainment Earth. Read on for available photos and more info. 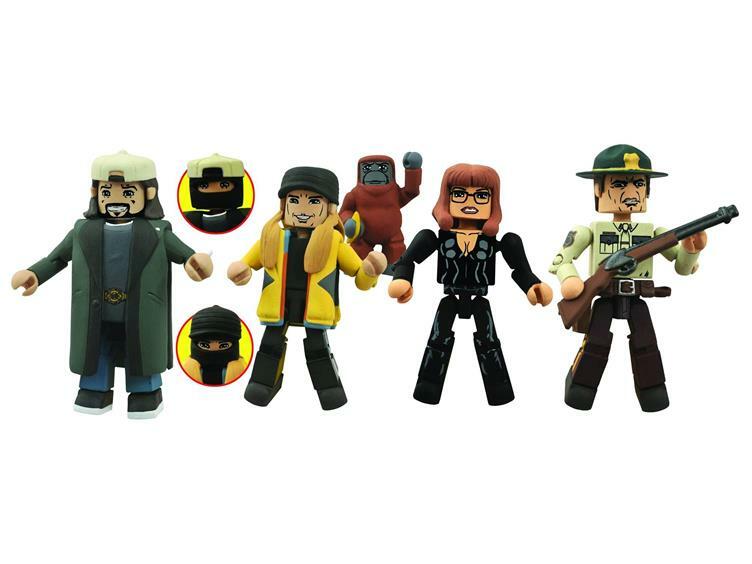 Jay and SIlent Bob return in a second box set of Minimates min-figures based on their biggest film, Jay and Silent Bob Strike Back! This time, a mask-wearing Jay and Silent Bob come packaged with Federal Wildlife Marshall Willenholly and notorious jewel thief Justice – plus a micro-‘Mate of their orangutan friend Suzanne! Each 2-inch Minimate mini-figure features 14 points of articulation and interchangeable parts. Packaged on a blister card. The newest series of Walking Dead Minimates is here, and this time it’s war! 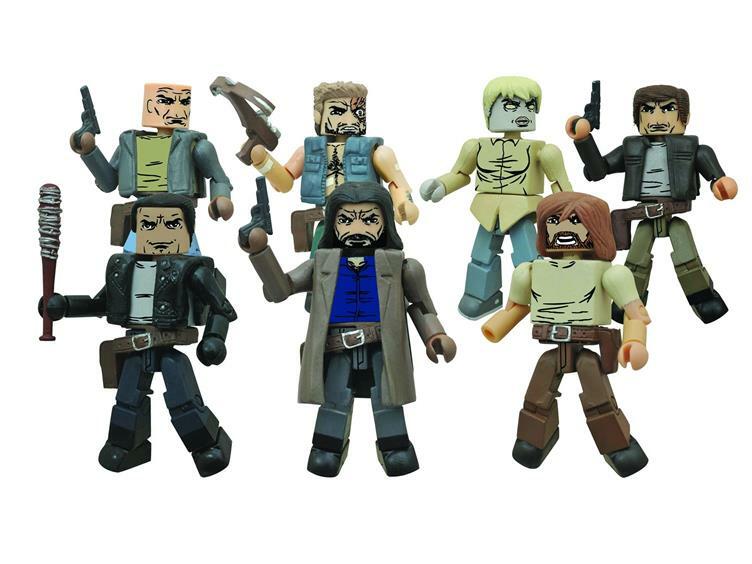 Featuring characters from more recent issues of the hit comic book series, this assortment includes three different two-packs: Rick with Jesus, Negan with Dwight, and Marauder leader Chris with Zombie Holly, plus a one-per-case variant set of Scavenger leader Derek with Zombie Holly. Each 2-inch Minimate mini-figure features 14 points of articulation and interchangeable parts and accessories, including an alternate head for Holly. Packaged in a full-color window box. Colonial Marines, move out! 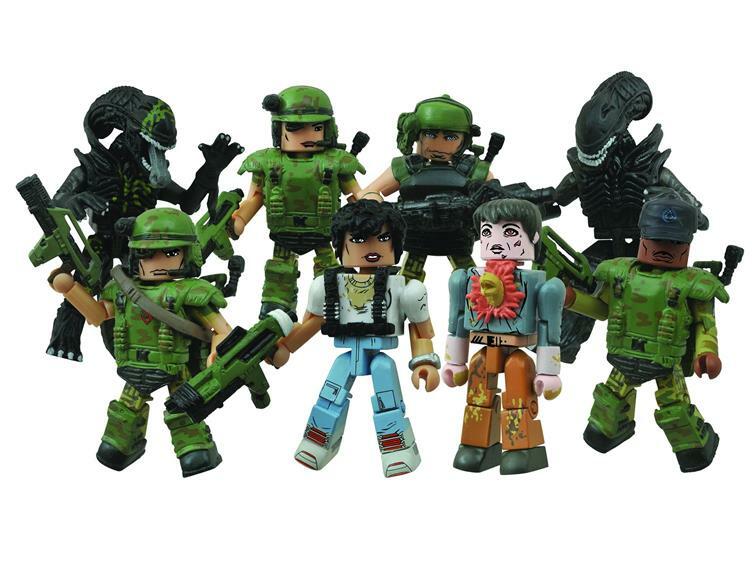 The first assortment of Minimates two-packs based on the classic 1986 sci-fi movie Aliens is getting ready to drop, and it’s simply bursting with all-new Marines and xenomorphs! The four 2-packs include Wounded Cpl. Hicks with Ripley, Pvt. Drake with Battle-Damaged Attacking Alien, Sgt. Apone with Alien, and Cpl. Dietrich with Infected Colonist. Each 2-inch Minimates mini-figure features 14 points of articulation and interchangeable parts. Packaged on a blister card. Batman’s rogues gallery continues to grow as the Penguin joins the Riddler and the Joker in Diamond Select’s line of busts based on the Batman Classic TV Series! This 6-inch tall resin bust captures Burgess Meredith as the fowl fiend, wielding a deadly umbrella and an equally deadly sneer. 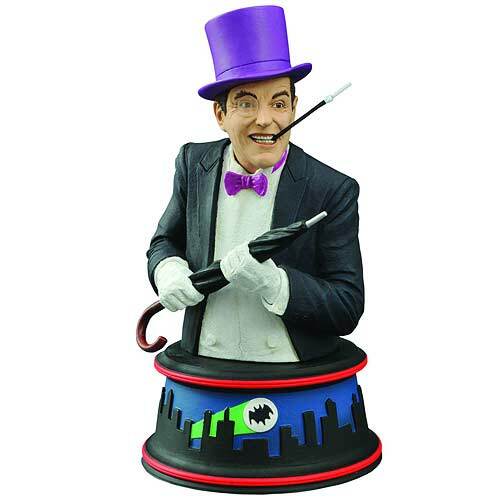 Sitting atop a colorful base inspired by the show’s animated opening credits, the Batman 1966 TV Series Penguin Burgess Meredith Mini-Bust comes packaged in a full-color box. On your next Dragon Age quest, why not keep your companions in your pocket? 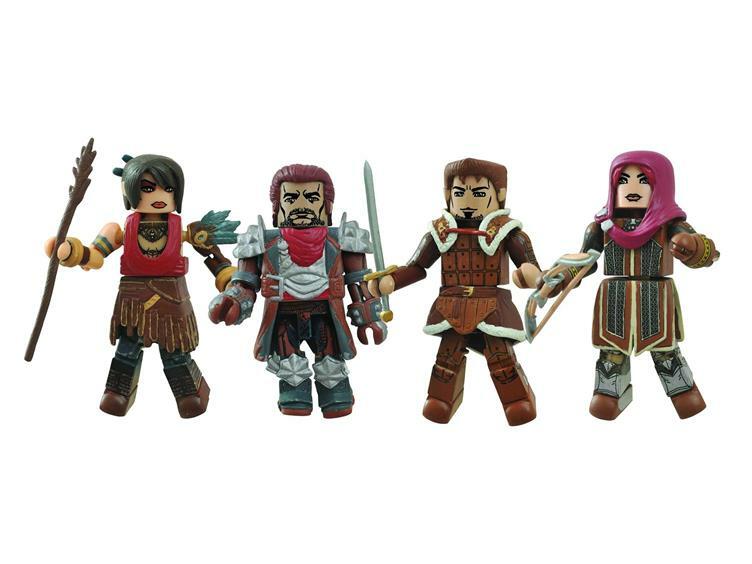 The legendary video game series kicks off an epic line of Minimates with this debut four-pack featuring the Grey Warden Alistair; the bard, Leliana; dwarf rogue Varric Tethras (with Bianca); and Morrigan, Witch of the Wilds. Each 2-inch Minimate mini-figure features 10-14 points of articulation and interchangeable parts. Packaged on a blister card. Hulk smash puny toys! The Hulk returns in a new look for “Avengers: Age of Ultron,” and DST is revisiting their award-winning action figure from the first Avengers movie with all-new sculpted details! Standing almost 10 inches tall, this Hulk figure sports 16 points of articulation and a spot-on likeness of the Hulk from the film, and comes packaged in Select-style display packaging, with spine artwork for shelf reference. Sculpted by Gentle Giant! 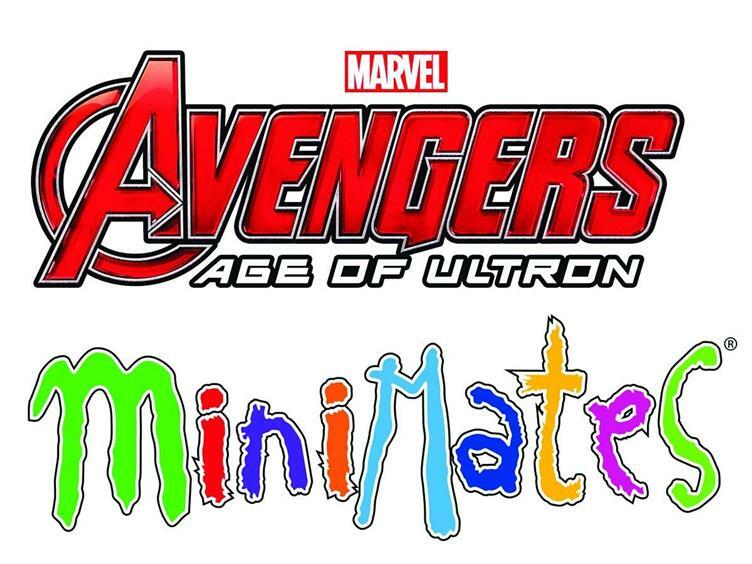 This is the first set of Minimates based on the Avengers 2: Age of Ultron movie! 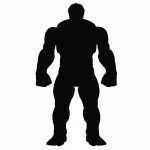 Four minimate 2-packs will feature Iron Man with Black Widow, Thor with Captain America, Hawkeye with Ultron and a rare variant pack of Hawkeye in his long coat with a Sub-Ultron! Each 2-inch Minimate mini-figure features 14 points of articulation and interchangeable parts, and comes packaged in a full-color window box. Designed by Art Asylum! Get your very own minimates from Avengers 2: Age of Ultron! This Avengers 2 Age of Ultron Marvel Minimates Mini-Figures Case includes some of your favorite superheroes like multiple different versions of Hawkeye, Ultron, Iron Man’s Iron Legion, and even rare versions of Baron Strucker and Nick Fury! This case contains 18 individually blind packaged Marvel minimates. Destroy all toppings! 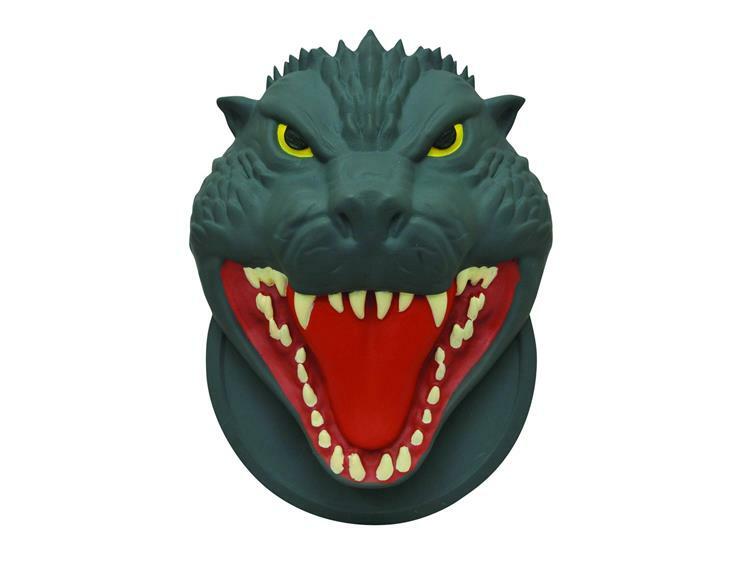 A monstrous hunger requires a monstrous slice, and you can cut yourself off a big one with this palm-sized pizza cutter featuring the sculpted face of Godzilla, King of the Monsters. Based on his appearance in “Godzilla 2000,” this menacing utensil will cut a path through a deep-dish pie like Godilla cuts a path through Tokyo! Packaged in a full-color box. Bring the magic of the movies home with the first board game ever based on the films of Kevin Smith! 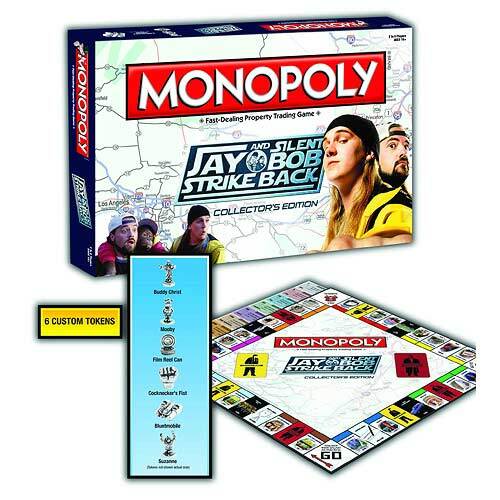 The cross-country adventure of Jay and Silent Bob Strike Back is now an official, authorized edition of Monopoly, with a game board featuring art and locations from the movie! Jay and Silent Bob Strike Back Monopoly also has themed Chance cards, Community Chest cards, and game pieces, all set to the same classic Monopoly gameplay! Packaged in a full-color game box with movie artwork. Marvel Select Yoga Pants Hulk. Stoked for the next WD minimates series, but Negan just looks kind of off. I think it's his hair, but can't quite place it. I'll definitely be grabbing him anyway, along with the much awaited Jesus pack. I don't necessarily need ANOTHER Rick, but the last Rick that looked like this couldn't remove his jacket and look right, so I don't mind too much. Definitely ordering the whole case of AoU minimates. Will we ever get a movie MS Black Widow?? ?